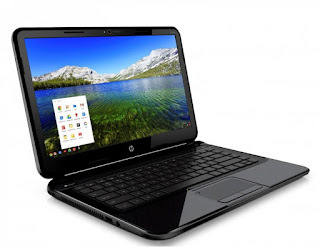 The other day we heard about how Acer were keen on continuing and diversifying their Chromebook offerings and perhaps it was this success which has lured HP into the fray to find out what all the Chromebook fuss is about! So what have we actually got here? Well first up there's a 14-inch 1366x768 display which is considerably bigger than the 11.6" offerings from Samsung and Acer are currently on offer. You've got that glossy black plastic concealing a 1.1GHz Intel Celeron processor, 2GB or 4GB of RAM, 16GB of flash storage, a HDMI out option and 3 USB 2.0 ports. All of this is crammed into a frame which is under an inch thick and weights in at just 3.96 lbs! Perhaps because of the size, this new Chromebook is the most expensive of the bunch so far and it comes in at $329.99, which is a bit more expensive than the offerings from Samsung and Acer at $249.99 and $199.99 (£229 and £199). Unfortunately the device hasn't popped up in HP or Google's UK websites yet, but we'll let you know if and when it does! If you're after more information on the device then you can check out Google's blog here or HP's American website here!